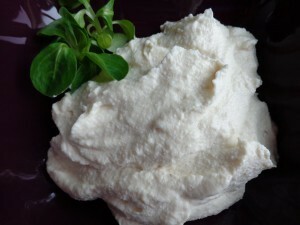 Almond purée, which is made with a base of cauliflower, is a vegetable dish, not a dessert. Daniel Rose suggests serving the purée alongside poultry, meat or fish. It may also be thinned with homemade chicken broth and served as a soup. Put a large pot of water on the stove to boil. Add the sea salt. Wash the cauliflower half, remove any leaves, cut in half again and remove the core. Break into flowerets. When the water is boiling, add the cauliflower. Cook for 15 minutes or until very soft. Drain and set aside. While the cauliflower is cooking, pour the cream into a medium-sized saucepan. Stir in the powdered almonds. Heat over a medium high flame, stirring constantly. When the mixture starts to boil, remove from heat, cover and allow it to steep for about 5 minutes. If you have a countertop blender, continue the recipe with Method 1. If not, continue with Method 2. Pour the almond-cream mixture into your blender while still hot. Allow it to spin for 5 minutes. Add the cauliflower and let it spin for about 10 minutes more, until very smooth. Turn the cooked cauliflower into a medium-sized bowl and purée with a hand blender. The purée should be very smooth with no trace of the flowerets. Now pour the almond-cream mixture into the cup of your hand-blender. Pulse repeatedly for about a minute, until very smooth. Add the almond-cream mixture to the cauliflower. Pulse to mix. Season the purée with salt. You may set it aside now for up to 24 hours. Before serving, reheat the purée very gently over a low flame. Serves 6-8. As this purée is very rich, servings should be on the small side. This is how the almond purée looked when served one January lunchtime at Spring. 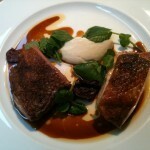 It accompanied roast guinea fowl and was garnished with watercress and calamata olives.